Bndtools is an Eclipse plugin that used bnd under the hood to create OSGi bundles. A bundle is a Java ARchive (JAR) that has a manifest with the OSGi metadata. Bndtools provides an IDE for developing these bundles with the least amount of work and maximum feedback. A core concept in OSGi is to create components that only use (service) APIs. I.e. it is recommended to restrict the compilation (or build path) to dependencies that only carry an API, not an implementation. Since APIs are not sufficient to run the component, it is necessary to provide an assembly that contains the components and dependencies that can provide the necessary implementations. In Bndtools this is a bndrun file although the bnd file can also act as such. Bndtools is accompanied with a Gradle build that uses the same bnd that runs inside Eclipse for continuous integration. An assembly is then tested and when accepted deployed. Bndtools can take a bndrun file and turn it into an executable JAR. Since development is a continuous process, Bndtools also support baselining, a technique based on semantic versioning to get warned when changes in API are made that are not backward compatible. Bndtools is a user friendly driver of the bnd library. bnd provides an abstract workspace/project model that Bndtools uses to tell Eclipse what to build. Since bnd has been growing up in parallel with OSGi itself it understands OSGi extremely well. It is an invaluable assistent for OSGi developers. A unique aspect of bnd is that it is an abstract build model. Because it is abstract, projects developed with Bndtools can also be built with Gradle without any extra effort. This is the perfect combination of a user friendly IDE and a solid continuous integration tool. 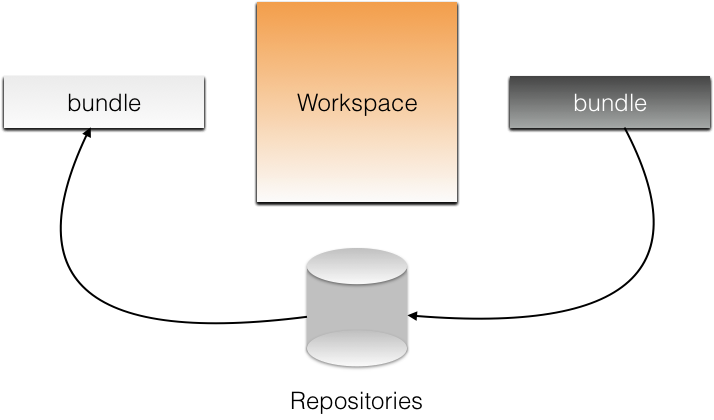 Bndtools uses the bnd workspace model. A workspace is a directory on the file system that has the file cnf/build.bnd. All configuration of Bndtools is done through bnd files. A bnd file is an UTF-8 file using the venerable properties format. The build.bnd file is the shared configuration. Any property defined in this file is shared between all projects. Other directories in the workspace directory are project directories if they contain a bnd.bnd file. In that case, the OSGi Bundle Symbolic Name is the name of that directory. Any properties defined in build.bnd can be overridden in the per project bnd.bnd file. Bndtools contains an easy to use editor that provides syntax highlighting for these bnd files. All information to build a workspace (that is, all projects in the workspace) is stored in these bnd files. No other information influences the result. 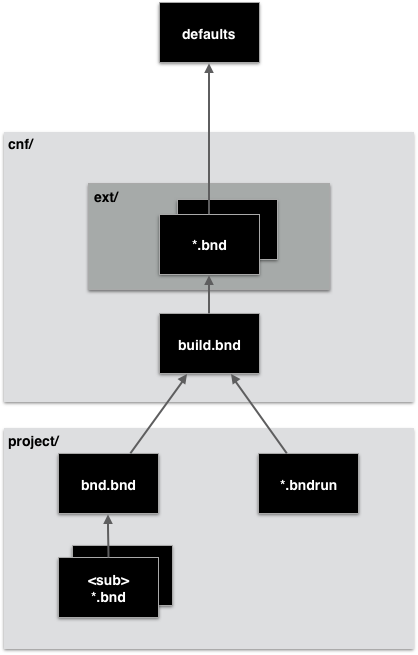 The following picture shows the inheritance structure of the different bndand bndrun files. Repository plugins map the external world into a bundle world. 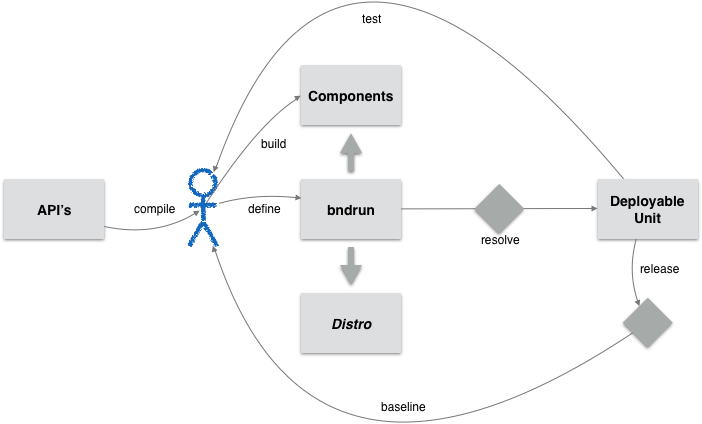 A general concept in bnd is that the repositories define an exact set of dependencies and not support transitive dependencies. The reason that the for many very useful transitive dependencies are not supported is that they tend to make horrible OSGi systems. Each project can depend on the bundles that are coming from the repositories. These bundles are explicitly listed in the bnd.bnd projects files. Bndtools will continuously build the bundles. Any change in the IDE, either a Java source file or a bnd file will automatically trigger a new build which will result in a new up to date JAR. In OSGi, a bundle’s manifest must list what packages are required in runtime. bnd calculates this manifest by analyzing the bytecodes and finding out what dependencies are used. It uses the metadata available in the dependencies to handle versioning so that the developer can mostly ignore these details. Any other metadata is also provided indirectly or explicitly in a bnd file. Each bnd.bnd file can set manifest headers for example. Before you can run an OSGi framework it is necessary to create an assembly of bundles to run. Bndtools provide unique support for this with the bndrun files. Instead of listing bundles, the bndrun file contains initial requirements. The Bndtools editor makes it possible to use drag and drop to fill this list from the repositories and the workspace’s projects. This support is based on the OSGi resource model. Bndtools provides a resolver that then takes the initial requirements together with the framework and repositories and calculates a closure of bundles that can run together. This feature has no counterpart in any other tool. Bndtools integrates the bnd launcher that is parameterized from the bndrun file. After running the resolver, the bndrun file editor shows a Run or Debug button that will launch the assembly. This launcher is completely integrated with the Eclipse debugging tools. Normal JUnit testing is clearly fully supported with Bndtools and will work as expected. However, Bndtools also supports OSGi integration testing. In this case, the bnd.bnd file defines a set of bundles (which can be assembled with the resolver) that provide the runtime for the test. Except for the menu entry, this kind of integration testing is then identical to normal JUnit testing. That is, the developer can select a test class or test method and execute the test while the results are displayed in the JUnit view. Although developers spend the far majority of their time in an IDE, the most important part of a professional development takes place in the continuous integration. Only when a workspace is build from scratch is it possible to verify that a build is repeatable. That is, a product that is generated on a developer’s desktop cannot be trusted. For this reason, workspaces generally integrate a gradle build based on bnd. By using the same underlying abstract build model, it is virtually guaranteed that when Eclipse indicates that the workspace builds fine, it will also build on a remote server. Bndtools provides an integrated release model. Although special tools are provided to release from the IDE it is highly recommended to only release from the continuous integration. bnd can release to most of its supported repositories. Maven is extensively supported, including signing. Bndtools can export a bndrun file to an executable JAR. This is a JAR that can be executed in any Java VM. The JAR contains the framework and all required bundles. When it runs with the venerable java -jar x.jar command it will unpack itself and launch a framework. The continuous integration can build this executable JAR. Once API is released to external repositories, Bndtools will track the version numbers and the binary compatibility of newer versions with the older versions. If the developer makes a change that is not compatible with the semantics of the versions then it will place an error on the place where the version is maintained and the offending code. For example, adding a method to an interface is not backward compatible and requires a n update to the version. In this case the new method will be marked as error until the corresponding version is updated.